Discussion in 'POTW Collaboration' started by Serebii, Jan 27, 2019. 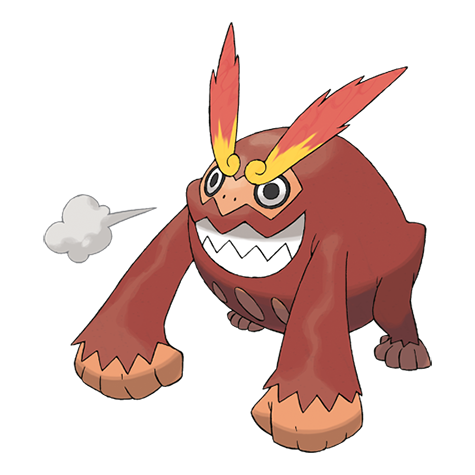 Hoo boy, Darmanitan is what you expect in a Fire type. Pure overwhelming offense. Darmanitan hits like a loaded dump truck with its engine doped with nitro. A Wallbreaker par excellence, unless you are packing a resistance or serious Defense, Darmanitan will be OHKO or 2HKOing you. However, this power comes at a price and Darmanitan can be a liability against swifter offensive threats. Darmanitan chunks near every physical wall in UU in one or two blows with a Choice Band, Sheer Force and Flare Blitz, with Suicune only eeking out the 3HKO thanks to leftovers, meaning none of these walls can really afford to be weakened in front of Darmanitan unless your opponent wants to lose a key pivot on their team. U-Turn is always fantastic for any Choice Pokémon, allowing Darmanitan to scout and leave a brutal parting shot on your opponent's switch in (and Darmanitan's best answer for Slowbro). Earthquake is for coverage and hits opposing Fire and Rock types very hard. Rock Slide and hits Talonflame, Charizard-Y, Rotom-Heat and Moltres very hard. However, this set has a very short shelf life. Entry hazards, especially Stealth Rocks, just wreck Darmanitan especially when accounting for Flare Blitz Recoil. With Darmanitan's paper like defenses, any nonresisted hit will gouge out a significant chunk of its health and outright KO it if it has accrued any prior damage. Grass types -Grass types easily resist the Water and Ground attacks Darmanitan fears and can easily dispatch the many bulky Water types that Darmanitan can't muscle its way through. Mega Sceptile is often Specially oriented, making it a decent offensive Core with Darmanitan. Klefki -As much as Darmanitan hates entry hazards on its side, it loves entry hazards on the opponents side, allowing it to nab a few more KOs. Klefki can setup Spikes and spread around Paralysis, making Darmanitan's job easier and nabbing KOs it would otherwise mise. Latias -Latias makes an excellent defensive pivot for Darmanitan, resisting Water moves and no selling ground moves, while removing hazards with Defog. Darmanitan in turn annihilates Steel types and Umbreon who otherwise trouble Latias. Slowbro and its Mega full stop. All Darmanitan can do is run with U-Turn or die to their STAB water moves. Defensive ground types like Gligar and Hippowodon need a free switch in, but can eat a hit and OHKO back with a STAB Earthquake. Revenge Killing -Many, many threats are faster than Darmanitan and unless it has speed control on its side, it is pitifully easy to revenge kill due to all the passive damage it takes. However, note that none of the truly faster threats can survive a blow, and thus need a safe switch in for the proper revenge kill. Background Information - N's Darmanitan. A fierce battler and a gentle giant. Darmanitan's competitive play-style as one of the best choice-scarfers lives up to it's Pokedex entry. According to the Pokedex, Darmanitan's punches burn at 2500 degrees and can easily destroy a dump truck with one blow but don't get intimidated by this friendly giant. 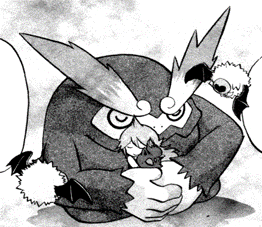 Darmanitan's most notable appearance in the Pokemon series, both the games and Pokemon Adventures manga, is that Darmanitan was shown to a young N as one of the Pokemon that was hurt and betrayed by humans, befriending N which lead to his one-sided belief that Pokemon should be liberated from their Pokemon trainers. 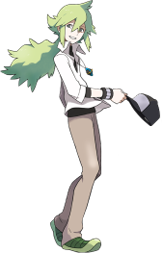 This was of course plotted by one of the most maliciously evil villains in the Pokemon universe, Ghetsis. Despite Ghetsis's cruel intentions, this has lead to N's Darmanitan to become a friendly-giant who opens up to and cares for N, becoming one of his strongest Pokemon battlers not as an owned Pokemon but as one of his Pokemon friends who is free to join or leave N's side. I mean look at the Pokemon Adventures picture. 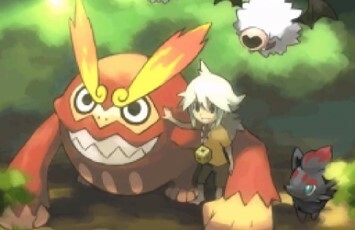 Makes you just want to hug Darmanitan right? Darmanitan's 2500 Degree Burn Sheer Force Set - Singles and Doubles. Darmanitan's classic choice scarfer set can be used in singles and doubles but it's arguably more effective in singles for the simple fact that it has a higher chance of being OHKO'd by Pokemon in doubles. Thanks to Darmanitan's Sheer Force, it's 140 base attack suddenly gets better. Flare Blitz becomes one of the most deadly attacks in the meta thanks to Darmantan's stats and sheer force but it is also one of Darmanitan's weaknesses as Flare Blitz's recoil damage wears him out over time which is why you may prefer the Sheer Force-powered fire-type alternative, Fire Punch which has no recoil cost. So I think we all get it that Darmanitan is a monster on the field but he does have some notable flaws, most notably his lack of type-coverage against water-types and his own fire-type weakness, the most effective counter against Darmanitan being classic bulky water types which is what U-turn is for. Don't even think about trying to take down that Suicune or Slowbrow unless you feel you have 100% no choice. So that's the gist of it, fast heavy-hitting Pokemon. However for some people, overpowering an already overpowered offense is the best defense. Although Choice Scarf Darmanitan allows it to outspeed practically all of the meta, some want the extra-fire power to mercilessly increase Darmanitan's offense power to the fullest in order to get as much sweeping potential as possible as long as Darmanitan can outspeed it. Contrary to popular belief, there is actually a way to make Zen-Mode good despite it's bad conditions and that's through Flame Charge. Darmanitan's Flame Charge is it's only reliable move to get it's speed increased from the very start accompanied with some small offense power. With Focus Sash, you can guarantee that Darmanitan survives one hit which will lead to Darmanitan getting Zen Mode. At the very most, you just need two Flame Charge's to double your speed to dangerous sweeping potentials. From this setup, you get one of the most extremely dangerous Special Attack offenses paired with very good sweeping potential. If your even luckier, perhaps your Pokemon still has around 50% health which may or may not be good enough thanks to Darmanitan's incredibly good bulk. So what's the downside to this? This is only if you really want to use Zen-Mode Darmanitan. To get an idea how bad Zen-Mode's 50% health cost condition is, this set is simply to reduces the very VERY heavy risks of using Zen-Mode Darmanitan and even then, Zen-Mode Darmanitan's best set is still very gimmicky. I suppose one small advantage Zen Mode Darmanitan has over Sheer Force Darmanitan is water-type coverage and that's really it. Sheer Force - Darmanitan's only standard ability, but it's a fantastic one: Sacrifice any and all secondary effects from your attacks in exchange for a 30% power boost. You all know it, you all love it. Darmanitan can make pretty good use of it, with it's flexible movepool and impressive offensive stats. Zen Mode (Hidden Ability) - The signature ability required to unlock the Zen Mode form, Darmanitan gets a boost of 60 points to its base stat total and adopts a much more defensive statline. This sounds all fine and dandy, until you realize that it only activates and remains active while Darmanitan is <50% of its total HP. Since the standard form (which would need to tank the hits) has tish defensive stats, it's extremely likely the slower Zen Mode form will get shot off the field in the following turn before it can do anything, assuming it even survived that first hit.. Compared to Sheer Force, this is a hard pass. 105 Base HP gives Darmanitan a modest amount of health-based bulk, but that's about all that can be said for it there. 140 Base Attack hits like a van speeding through a school zone. With the combo of Sheer Force, which can be easily stacked with a Life Orb, this can let Darmanitan hit really, really hard. 95 Base Speed is respectably quick, especially if invested in. It's certainly not breaking any records, and comes up a bit short compared to many faster options, but it's certainly workable. 55 Base Defense and Special Defense is genuinely awful. Combined with Darmanitan's poor defensive typing, this basically negates its otherwise great HP values. 30 Base Special Attack is trash, short and simple. Not that you'd be running a special-set Darmanitan, given it's impressive physical stats and movepool. 105 Base HP is pretty key, as it's the only thing that'll let you activate Zen Mode in the first place. Unfortunately, it won't be a stat you can really capitalize on compared to its other defenses. 140 Base Special Attack lets Zen Mode Darmanitan capitalize on the relatively diverse special movepool it has access to with impressive results. This is slightly complimented by the dual Fire/Psychic typing it receives while in Zen Mode. 105 Base Defense and Special Defense, combined with its HP stat, would be excellent for a bulky pokemon. Unfortunately, Darmanitan needs to be at half health or less in order to remain in Zen Mode, so these stats are far less effective than they'd otherwise seem. 30 Base Attack is half the price of activating Zen Mode. While you'd probably be running an exclusively special toolkit on Zen Mode builds, this makes the viability of a mixed set relatively nonexistent. Even Belly Drum won't really make it workable, especially in light of the next problem. 55 Base Speed is terrible. It's now far too slow to run for a standard sweeper sort of build, yet it's too fast to out-slow most pokemon who'd benefit from Trick Room. This means that Darmanitan is extremely likely to take an additional hit before it gets any opportunity to utilize Zen Mode to any real degree. Certain support builds (like Speed Boost Baton Passers) can kind of make up for this, but why would you bother supporting Darmanitan for that when so many other superior options exist? Flare Blitz - Absurdly powerful, especially if under the influence of Sheer Force and a Life Orb. Even pokemon who resist it will be left reeling. Fire Punch/Fang - Strong STAB moves primarily due to Sheer Force boosting their effectiveness. The drop off in strength compared to Flare Blitz is very noticeable, but the lack of recoil damage will greatly improve your Darmanitan's lifespan. Superpower - Another impressively powerful attack, Superpower gives Darmanitan a solid coverage option thats consequences won't really mean anything to it; Darmanitan's defense is already bad enough and its attack stat is high enough that it can afford one or two drops before switching becomes necessary. Zen Headbutt - A solid coverage move that gets the slight bump from Sheer Force. Belly Drum - If you can afford to set up with this, Belly Drum will let you ruin the day of at least any one pokemon on your opponent's team. You may want to run such a set with a Sitrus Berry or Wish support if you want to get the most bang out of this buck. U-Turn - A decent scouting move that lets Darmanitan keep up the momentum for the switch while at the least slapping some chip damage on the foe. Earthquake - Your run-of-the-mill strong coverage move, extra handy for double battles as well (assuming you have a partner who flies/levitates). Works wonders, not much else to say about it. Rock Slide - Just like Earthquake, Rock Slide is a solid coverage move, only with significantly less risk to your partner and benefiting from Sheer Force. Jolly, 252 Spe, 252 Ata, 4 Hp - This'll help get the most out of your Sweeper-style build, maximizing Darmanitan's speed while obviously wrecking shop with its already obscene attack stat. If you feel the speed won't be too much of an issue, you can opt in for an Adamant nature instead, if you wish to absolutely top off your phsyical hits, though this likely won't be necessary.